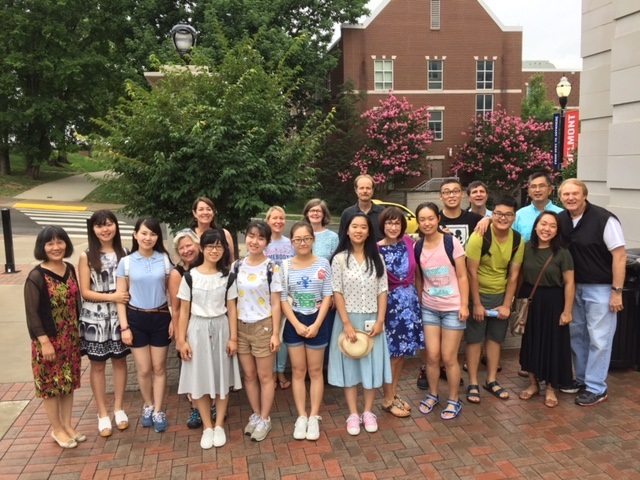 Belmont’s Department of Asian Studies has partnered with its sister school in China, Zhengzhou University, to bring the first group of Zhengzhou students to Nashville for a summer program. The nine participating students are undergraduate English majors interested in studying abroad for the first time with aspirations to travel after graduation, become teachers or translators and interpreters for businesses and government. The students are accompanied by Professor Zhao Jianxia, party secretary of the School of Foreign Languages and professor of British and American literature and culture. The group has been in Nashville for nearly three weeks and are participating in two courses including Dr. Ronnie Littlejohn’s “American Culture Through Film,” featuring classics including “Dances with Wolves” and “The Color Purple” and Dr. Marcia McDonald’s “American Literature,” which surveys writers from the Revolution to the contemporary musical lyric. In addition to studying film and literature, the students have participated in excursions featuring the best of Music City — dancing at the Wild Horse, Opry Mills, Wave Country Water Park and a Nashville Sounds baseball game. They also enjoyed a one-day homestay with Belmont faculty volunteers. The students are also encouraged to explore the city on their own or with program staff, selected from Belmont’s Asian Studies majors and graduates. The trip also features some of southern culture’s traditional foods including Cracker Barrel, Hattie B’s hot chicken and Tex Mex. This year’s program will be the first of many to follow, highlighting the relationship between Belmont and Zhengzhou University.